Andrea Robinson | His Kids Too! When I was married at 25, my health had dictated it would not have been wise at that time to become pregnant. My mother had said why don't you adopt? I think perhaps this was a very early sub conscience seed that was forever etched in my brain. I remained married for 10 years, and never felt it would have been a good time to raise children, under our circumstances. We divorced when we were 35 and I thought I had plenty of time to find someone and still have children. After all, so many stars in Hollywood were having children in the late 40's and 50's.! I thought great! I have another 10 years to find my soul mate and have children. Little did the public know the women were buying eggs from 20 year olds claiming them as their own. Ahh.. Hollywood. As I was moving past 40, Mr. soul mate still eluded me, and I knew the chance for pregnancy was going to become harder, even though birthing children was not a major drive in my life. So as I turned 42, I started my exciting journey in the internet to study adoption. I decided that I was not going to live on the planet without children, and perhaps I could find the guy later. After I read the horrible fate of children in the orphanages of Eastern Europe, I decided that those children have a seriously difficult future compared to children of America. I feel everyone has an opportunity for a great life in America, but this is clearly not so in the depressed countries of Eastern Europe. As the children age out of the orphanage at 16 years old,10% of them commit suicide within the first year. 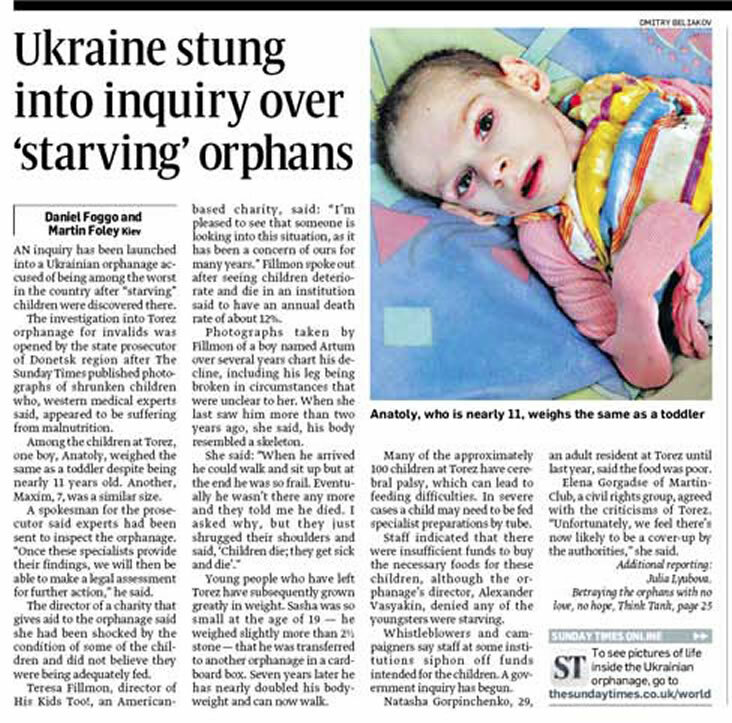 Knowing this, I decided to adopt in Ukraine. Also, I am UKrainian decent, things were falling into place. This is when I met Teresa Fillmon online at EEAC Ukrainian adoptions. We were both doing our paper work at the same time. I went to Kiev in Nov. of 2000, I had some dossier problems, so I stayed in Kiev for 3 weeks and visited some other older children orphanages in the city. I remember a boy who was 15 and had a family visit in Long Beach, Ca through a church. The photo book of his trip was all he owned in his life, and was waiting for them to return for him, but they had decided not to adopt him. He didn't know this, he just kept waiting for them. I did not want to adopt a child over 2 yrs. old, but I kept myself open up to 10 years old. But….I truly wanted to change diapers and live through every stage possible. I found my son Alex at 1.11 yrs. old, in the Donetsk Region. The baby house welcome sign reads, There are 200 of us waiting for you everyday. It was clean, warm, and safe. Their bedtime was at 9 – 10 p.m. and up at 6 am. They did not have diapers for bedtime, they marched the little children 2 X a night to sit on the pots . My son was the size of an 18 month old but he was 2. I didn't understand why he would be falling with no reason every 8 minutes while he played. He was completely exhausted. When we got into the hotel, I put his first pull up on him and let him sleep the 10-11 hours he needed, within 4 days this behavior ceased. Within 6 months of great food, sunshine, laughter, and lots of kisses (he DID have love in the orphanage) he grew 4 inches. After seeing 4-5 orphanages and knowing from experience where my son would be if he was still in the system, I had to find a way to give back when I returned home. That is when I ran into Teresa online again, to find out she had a beautiful daughter from Donetsk, and had a charity that was taking donations back to Donetsk. I was elated! Ukraine gave me the most beautiful treasure in my life, finally I can say thank you. I showed all my married and single friends His Kids Too web site, and what Teresa was accomplishing. Everyone had committed to saving clothes, shoes toys, movies, and hygiene items, I send about 300 lbs a year of great clean clothing. I know that these donations will clothe hundreds of children and widows, I feel elated every time I close up the boxes and send them. Yes I am a single adoptive mother, and yes it is important for children to have male and female influence equally. But no, it is not better for these kids to remain in orphanages just because you do not have the perfect situation. My dear father helped me raise my son until his passing in Feb. 06. When I was crying my son came to me and said, "Mama, I'm here, I will kiss your tears away". Alex is a true joy. If you are single or married and thinking about adopting. Just do it. 🙂 I laid in bed at night with my eyes wide open,,, how can I do this? I kept moving forward everyday and kept my eye on the prize. They say raising children is the hardest thing you will ever love doing and if it was 1000 times harder, and I knew who my son was, I would still do it. If you are now searching, be patient, as pregnancy is possible, adoption is for sure. There are 80,000 orphans in Ukraine, they are wonderful, smart, beautiful children and just know that your child is waiting for you. What a precious gift children are, they are a true spiritual cycle of life. But please …don't delay, these children pray everyday to have a family. They have a horrible future ahead of them. Good luck in your search and thank you for those of you that will donate. Blessings and respect to those who are reading His Kids, Too! web site. This means your thinking and feeling for others.